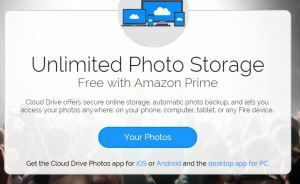 Amazon has launched a new benefit for their Amazon Prime members – unlimited free storage of photos to Amazon Cloud as well as auto-upload of your smartphone’s videos and photos from the Amazon Cloud app for iOS or Android. Amazon calls the new service, launched this week, Prime Photos, and it enhances the 5 GB of free file storage already available to all Amazon customers. Additional storage prices start at less than $1 per month. Amazon Fire Phone owners and those who own one of the latest generation of Kindle Fire tablets also receive free unlimited storage for all of the photos taken with their devices. With Prime Photos, Amazon Prime members’ photos no longer count toward their cloud storage limits. Amazon Cloud functions much like Dropbox or Google Drive, letting you automatically back up your smartphone’s photos and videos and access them from other Internet-connected devices, such as your tablet or home or office computer. You can install the Amazon Cloud App for Windows for ease of accessing your files. Amazon Prime already offers significant benefits for the $99 per year outlay, such as free two-day shipping on most items, streaming of a large selection of Amazon Instant Video movies and TV shows and the Kindle Owner’s Lending Library. It also includes a free book each month through Kindle First along with the Prime Music service – unlimited, ad-free streaming of over a million songs and hundreds of playlists with unlimited skips. For an additional $9.99 a month, enjoy Kindle Unlimited , which gives you access to a wide variety of books to check out, up to 10 at a time. Kindle Unlimited features a fantastic selection of books, including several popular series, such as “Diary of a Wimpy Kid” and Harry Potter.